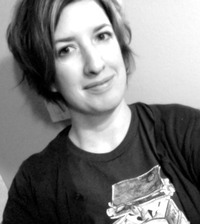 She is the author of contemporary novels such as: The Next Door Boys, Night Sky, Knee Deep, and My Heart For Yours. 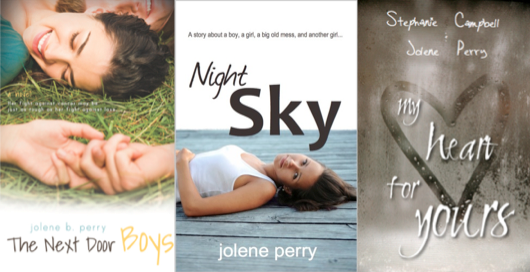 Check out my reviews of The Next Door Boys, Night Sky, Knee Deep, and Spill Over. She is also the author of newly released and upcoming anticipated titles such as Left To Love (The Next Door Boys #2), After All, and Want To Be, a companion novel to The Next Door Boys. As well as the books with the covers above and other released books. In other words, Jolene is a writing machine! "Without meaning to, the very first book I wrote was a New Adult book. There was no word for it at the time, so it was sold as a Young Adult book, even though it was a college age girl. Now, we have this new genre or category of fiction arising called New Adult – for ages 18-25 (or so). There are a few things that I love about writing in this age range. First off – there are still a lot of firsts to be had at this age. A LOT. And that, to me, is one of the best things about writing YA, but I get it here, too. Second – One of the bummers in YA is that the endings are usually “happy for now” endings. It’s a happily ever after as far as the story’s concerned, but they’re fifteen, or sixteen or seventeen or… young enough that we can have hope that the solution is a lasting one, but nothing is definite. New Adult gives me a chance to write a more definite happy ending. We don’t just hope, but the characters are old enough and we can sort of KNOW that they’ll be okay. There are so many awesome things about this time in most people’s lives, and I’m SO glad that this genre is finally being recognizes for the awesomeness that it can hold. A few of my favorites are Going Too Far by Jennifer Echols (which was released as a YA, but it’s not really) Easy by Tammara Webber and Lengths by Steph Campbell and Liz Reinhart. I just released 10 Weeks, which is one summer told by three different points of view, of three close girl friends. That was written by a good friend, Janna Watts, and myself. And then my next New Adult, Falling, comes out in November :-) "
I was given the chance to review 10 Weeks and I jumped right to it. I read this novel in a single day and I really enjoyed it. I personally think for us people in our 20s who might have outgrown some YA novels and are sometimes in the awkward stage of not knowing with to crush on the cute or hot 15 or 17 year old without feeling guilty, new adult is the genre for us! Below is my review of 10 Weeks! 10 Weeks is part of a new emerging genre called New Adult. 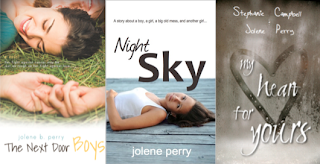 I am sure you have already heard about this genre and Jolene Perry even discusses above. 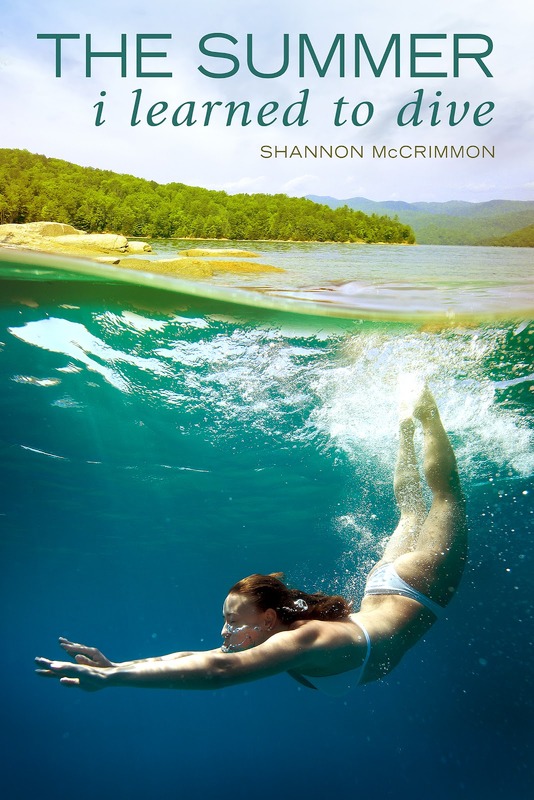 10 Weeks is set during 10 weeks of summer camp and is about three girls who are counselors. We’ve got Kay Kay who is 19 and is in love with a man that is 40. Then we’ve got Jody who can’t get over her two-year boyfriend breaking up with her because they now moved in different “directions”. And lastly is Sam, the girl who is running away from the love she thinks she doesn't deserve. Each girl’s part is 60 pages long. We start off with Kay Kay. She’s this 19-year-old independent girl who doesn’t care about what anyone thinks. She does what she wants and when she sets her mind on something, or shall I say someone, she usually gets what she wants. Over here it is Alex, the 40-year-old counselor. I enjoyed Kay Kay’s story the most out of all of them because it was definitely unique from the usual YA novels I read. Kay Kay’s story is for the span of all 10 weeks, you also see her conversing with Jody and Sam and you get hints of what is going on in their time at the camp. The next story is about Jody, we go back to the first day of camp. She’s heartbroken over the breakup. However when she lays eyes on the new bartender at The Little Minnow Bar and Grill close to camp. He’s Irish and maybe the distraction she needs? But Jody is a commitment kind of girl and adding in a heartbreak? This relationship was full of hiccups and frustration for me, though I really enjoyed it. Again you can relate to these girls in how they make their decisions; Jody is 20, she’s not reckless and impulsive. She thinks of the consequences and I sometimes miss that in YA novels. The last 60 pages stat again at the beginning of camp and this time we see Sam, a clichéd 21-year-old bad girl who is running away from what truly makes her happy because she thinks she doesn’t deserve that. Now here… this is a story I’ve read many times in YA novels, with a little less swearing and bad attitude. I personally enjoyed this story the least since I find it very frustrating, in a bad way, that someone would think so little of themselves that they think they don’t deserve happiness. Overall I really enjoyed 10 Weeks, this is told from three very different girls. Jolene Perry and Janna Watts have written a great New Adult novel that breaks the usual stories of YA novels. I hope they continue on writing more NA novels together or alone because I need more of the NA genre! This sounds fabulous. I haven't read any of her books, but I have Night Sky. I really should get to that sometime soon. It sounds like she is a really great author. Great review and guest post! It sounds like good stories. I bought it but haven't read it yet. I can't even begin to explain my love for the New Adult genre, I'm such a huge fan. I'm an older reader of YA fiction, and have always just sort of imagined the characters to be several years older than they actually are just so I can connect to them a bit more, and then this genre comes along and makes me a very, very happy reader because I no longer have to tack on those couple extra years. I love what Jolene said about having a more solid happy ending for characters in this genre as well, there's definitely a little bit more surety for someone who's 25 rather than 15. Can't wait to devour 10 Weeks! I'd have to disagree that YA usually has a happy ending. I've read plenty of books where people die in the end, or are separated, or whatever ending you want to throw out there. That's the beauty of YA, sometimes a sad ending is what teens need the most in order to deal with their own realities and I think it's important to remember that. Also, I think a lot of YA is written where the teens act more like college age kids than high school age kids, so that's something to take into account as well. Great post! Hey Anna! What Jolene meant is that even with the happy ending in YA it isn't really definite. Of course thats the same for NA but there is a higher probability that thats who the protagonist is going to end up with. I believe that YA is more innocent and about firsts while NA is more about lasts, where people usually settle down. I need to read all of her books ASAP! I love new adult and Jolene perry. I read and fell in love with Knee Deep and 10 weeks sounds super awesome too! Thanks for the great review and sharing thoughts on the New Adult genre. I have not heard much about this author for some weird reason. I haven't actually started reading New Adult. I read a couple I guess but at the time just considered them YA because that's what they were marketed as. I really like that NA can mix adult and YA a bit and get edgier. 10 Weeks sounds awesome! I'm going to go add this author to my to-read list! THANKS SO MUCH FOR HAVING ME ON!!!!! !